Hello Crafty Friends - Annie here with a fun holiday card. The season is here for us to start creating and send out cards to our friends and family. 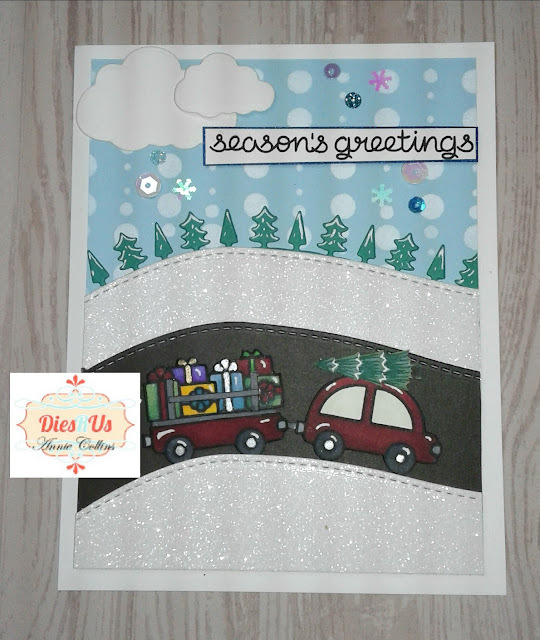 For this card I created a simple scene of traveling for the holiday season. Using mostly Lawn Fawn products. 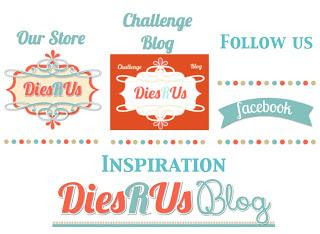 This a simple die cutting and layers type card. ** Unfortunately I lost my step by step photos I hope my description of how I made this card is helpful. I started by stamping the images from Lawn Fawn Home for the Holidays stamp set. I stamped the car twice. I trimmed off the top have of the car to create a utility trailer. I colored the images with my Spectrum Noir Alcohol Markers. I trimmed 3 thin strips of gray card stock to create the gate for the trailer. Next, I die cut 2 snow from white glitter card stock and 1 hill from black card stock using Lawn Fawn Hillside Border Die. I also die cut 1 Forest Border and 2 Simple Puffy Clouds. I set all my die cuts and colored images a side. Then, On light blue card stock using a bubble stencil and white dye ink I created a snowy sky. I then assembled my card by layering and adhering the tree border onto the blue card stock, next the snow hill, road and snow hill. Once I had all the background adhered in place. I then adhered the present onto the trailer. The tree onto the car and also attached the car and trailer together. Using foam adhesive placed the car and trailer onto the card front. Next, I adhered the 2 clouds to the card front layering them and using a bit of thin foam adhesive on the small cloud to give some dimension. For finishing I stamped the sentiment which I layered onto dark blue card stock and I added a few sequins. This is such a fun and festive card. Love the scene you created! Such a fun Christmas scene and card! Love your creation today Annie! Such a cute traveling scene! Great job! Thanks for inspiration! Anne, this is so fun!